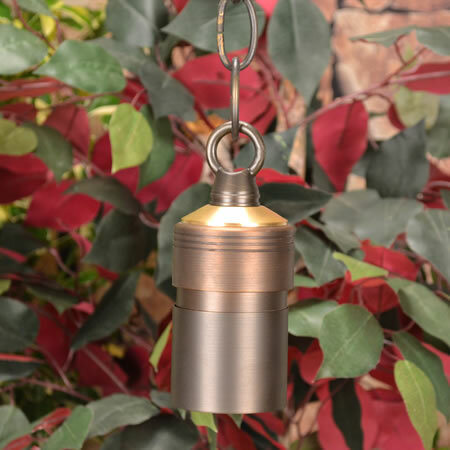 The Comet-HG is a cast brass hanging fixture with 1 foot of chain and a new lock and load shroud. It is ideal for trees, gazebos or other structures. The Comet-HG is the perfect choice when you need a softly lit environment. Precision machined from solid brass casting. Body design provides enclosed, water resistant wireway to protect wires. Precision machined brass. Accepts up to one additional lens/hex cell accessory. CComes with a complete set of optical designer lenses including: spread lens, frosted, hex cell. For use with a halogen lamp up to 20W MR16 lamp. A remote 12V or 24V transformer required, may be ordered separately from Unique Lighting Systems®. Voltage range for 12V halogen lamps is 10.8V to 12V. Voltage range for 24V halogen lamps is 21.6V to 24V. 1’ brass chain, brass mounting hook.